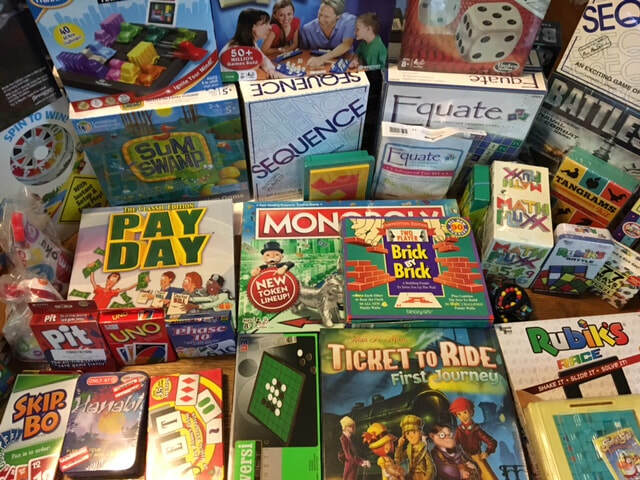 The Burgess Math Games Lending Library (MGLL) is open to students in grades 3-6. It is funded through a generous grant from the Tantasqua Educational Foundation (TED). The MGLL provides students with the opportunity to borrow one of 50+ games. Games will be sent home on Thursday or Friday and should be returned to school by Tuesday. Check out the library menu to choose the perfect game! New games being added all of the time! Check out the Game Info and Links page. Click through this website to find a list of offered games (including topic covered, suggested age ranges, number of players, and approximate playing times. You will also find a summary, images and directions for many of the games. Games can be requested by printing out a request form or emailing Bethany Runnals (runnalsb@tantasqua.org). All emails must include game title, student's name and homeroom, and parent's name and email address.